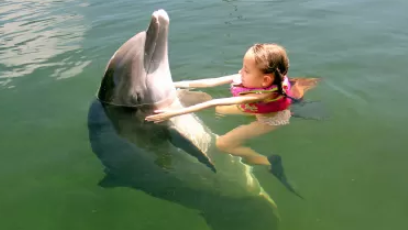 Immerse yourself in the Florida Keys Dolphin Swim program. 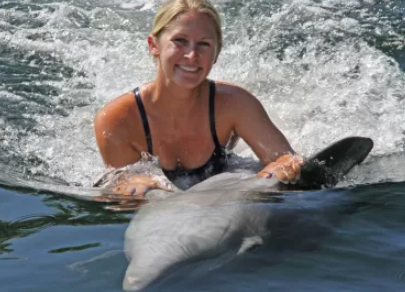 With this exclusive full day of activities, you’ll have a chance to swim with dolphins and see marine animal shows that will put a smile on anyone’s face. Plus, don your swimming gear and frolic under the natural salt waters and snorkel with tropical fishes and all their aquatic friends. Relax and take time to enjoy all the wonders that the Florida Keys has to offer you. 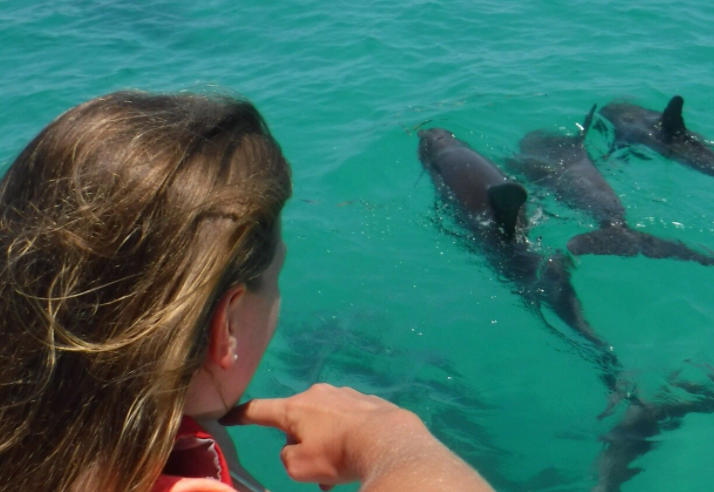 A 30 minute shallow and deep water experience with the dolphins. 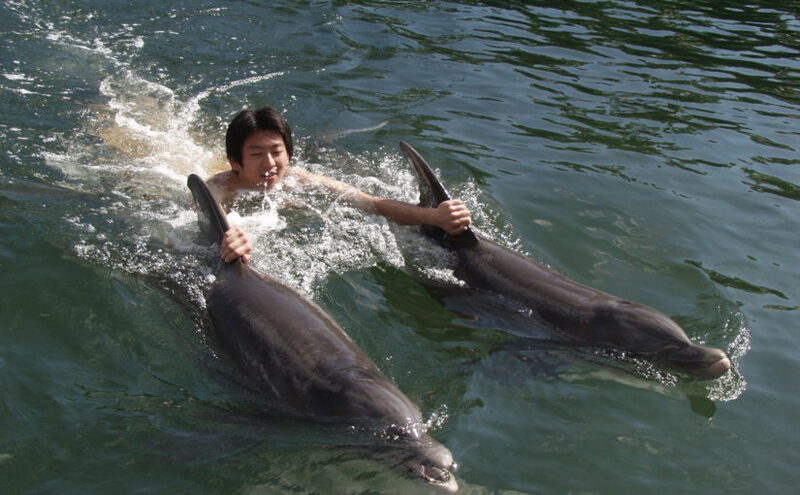 The Dolphin program including touching, training with a dolphin and the opportunity for a deep-water interaction with a dolphin like a dorsal fin ride from one end of the natural salt water lagoon to the other, plus other deep water behaviors, and free swimming and snorkeling with the dolphins. 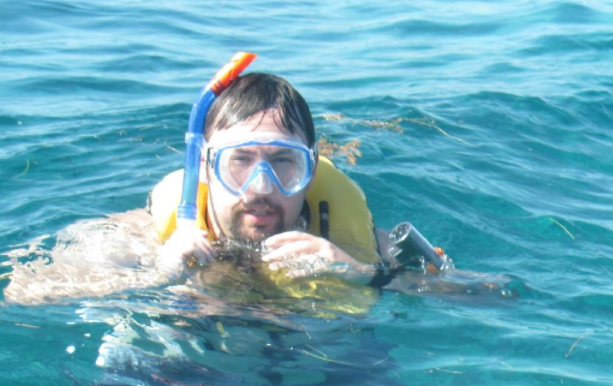 The Snorkel Trip includes a 2 1/2 hour Boat Trip to John Pennekamp Coral Reef, includes 1 1/2 hours on the reef snorkeling. 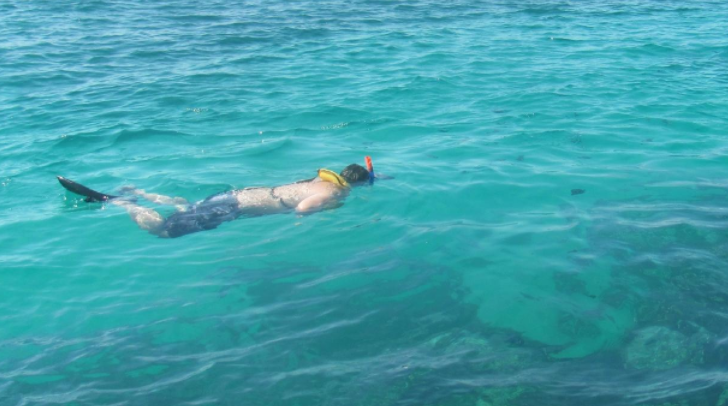 With the Snorkel Trip, You can come and go on the reef as much as you want and plenty of room on boat to relax and rest. Theater of the Sea is on Islamorada in the Upper Florida Keys. Sundiver Snorkel Boat is in Key Largo in the Upper Keys. You will get complete ticket and directions either by email or text. You can not get lost. Key Largo to Islamorada approximately 20 – 30 minutes by car. Free All Day Parking available. Food is available for purchase at dolphin facility. 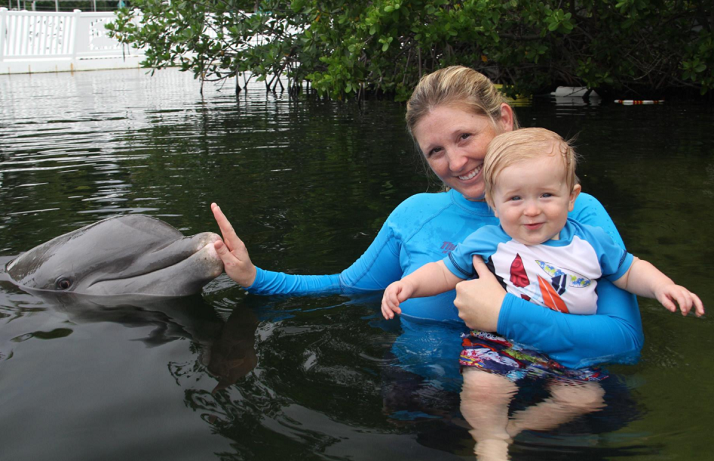 The Dolphin Facility and snorkel boat is open 7 days a week. All Participants must be 5 years old and up. Anyone within 5 – 7 years old, must have a paid Adult participant(An Adult is anyone 18 years or older with the child). Any Participant Person within 8 – 17 years old, must have a paid Adult observer or participant (An Adult is anyone 18 years or older). It will be a full day of activities. 9am – 5pm. You will have time to take quick lunch break on your own between each programs. 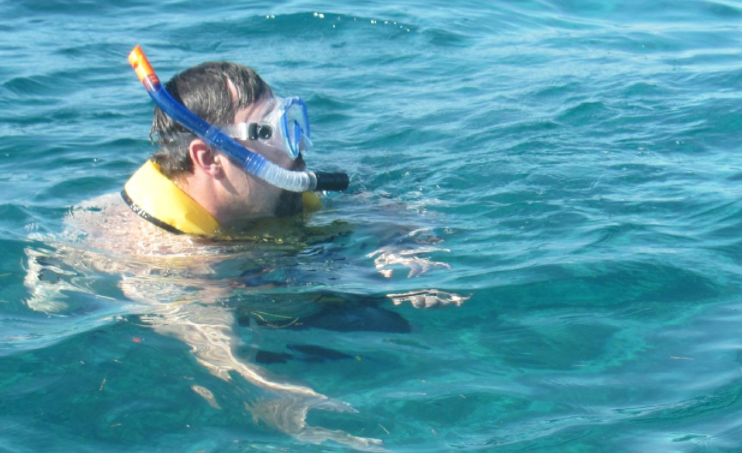 Mask, Snorkel, Fins, and Life Vest are provided at no extra cost with both programs. Wet suits can be rented – $10 per suit. Guests should bring their own bathing suits & towels. Showers, changing room are provided. Lockers can be rented. The time slots available includes a guaranteed 30 minute dolphin program, 1 1/2 hour snorkel boat trip, educational briefing, dolphin shows, sea lion show, & marine park tours. This is a Full Day of activities. The Dolphin Facility is in the Florida Keys and on Islamorada, which is one of the major island in the Upper Keys, next to Key Largo. You will get complete written directions with your online ticket. The Snorkel Boat is in Key Largo. These two two location are about 30 – 40 minutes apart from each other by car. Driving Times: These times are approximate from the location listed below to Key Largo area, depending on traffic and weather conditions. Minimum of 2 Persons for Pick Up Service. No Van Pick UP Service on Sunday. Round Trip Transportation Per Person from any Miami/Dade Location $75 per person. Round Trip Transportation Per Person from any Ft Lauderdale/Broward Location $95 per person. Round Trip Transportation Per Person from any Key West / Big Pine Location $95 per person. Round Trip Transportation Per Person from any Key Largo Location $75 per person. You must state on the reservation form whether you want transportation or not. Tickets and Pick Up Time will be emailed to you. Upon arrival, please proceed to check-in window, present your dolphin program confirmation number or your last name, which you will receive after making your reservation. NO REFUND WILL BE GIVEN TO ANY ACTIVITY PARTICIPANTS who cancel within the 7 day period, does not show up, are late for scheduled program(s). Once a reservation has a confirmation number and confirmed, a refund or change can only be made more than 7 days of the activity date and any change to the program date is subject to availability. Changes made to existing reservations are subject to a $25.00 per person change fee. Does your program go on Rain or Shine? Yes, this program goes on Rain or Shine. The dolphin swim and shows, will go on most of the time. If there is thunder, there might be a delay before the program resumes again. The snorkel portion of the day could get postponed or canceled due to weather. If your snorkel trip does get canceled, you can reschedule or get a partial refund for that part of your day. Must I know how to swim to participate? You should be comfortable in the water. The dolphin swim takes place in a 15 to 20 foot deep lagoon. What does it mean to be an Observer? An Observer is a Participant’s friend or family member. Observers participate in all aspects of the program minus the in-water interaction. During the interaction you can cheer on the Participants and take photos. The Observers stay in the stands and have no contact with the dolphins. The fee includes complimentary admission to the dolphin park, so you can see the rest of the shows and exhibits. Observers under 10 years old must be accompanied by an adult. What should I bring? A bathing suit or swimming attire is required. You can rely on us to provide the following: Showers, lockers(refundable deposit), and wetsuits. Wetsuits can be rented. All jewelry must be removed prior to entering the water. 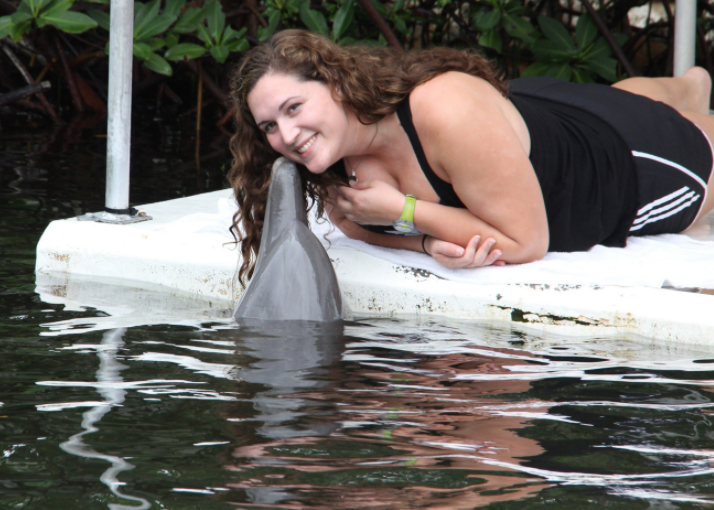 What about taking photographs with the Dolphins during my session? 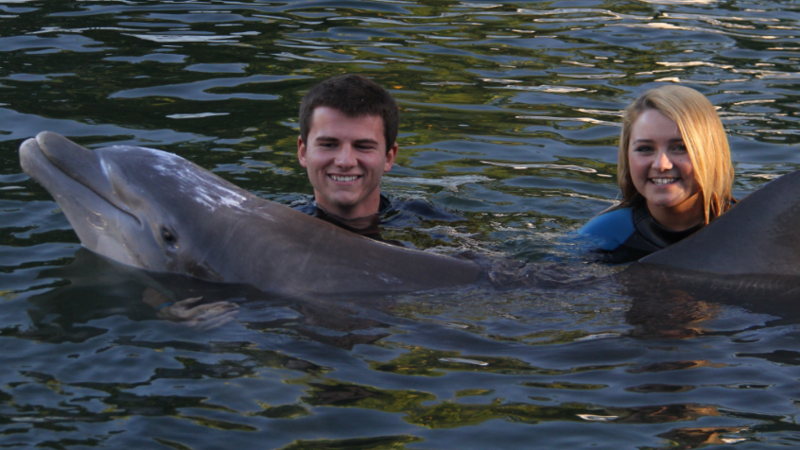 Yes, there are professional staff photographers taking photographs or video of you and your dolphin session. You can purchase these photographs after your session. Prices ranges from $40 and up, depending on how many photographs you purchase. 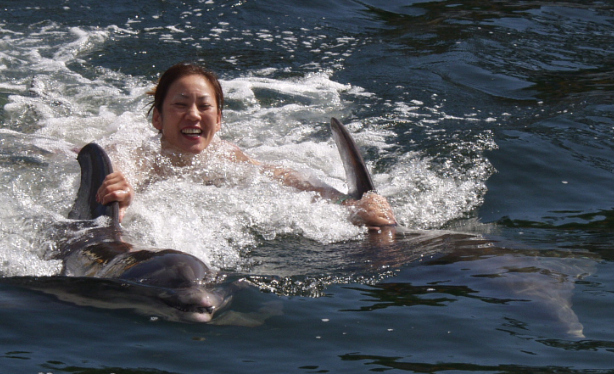 You can not take a regular camera into the water with you during your dolphin session. If you do have a family or a friend come with you as an observer, they can take photographs of you during your session. Hint: If you don’t have an observer in your group, you might ask another observer from another group to take a few photographs with your camera. 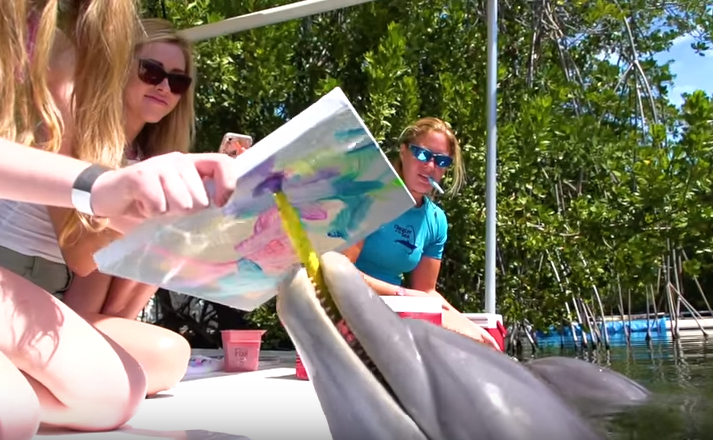 What kind of pools do the animals live in at the Dolphin facility? The animals live in natural salt-water lagoons. The water is pumped in from the Atlantic Ocean. How big is the lagoon? The lagoon is three acres in size with an average depth of 15 to 20 feet. The rest of the property is about 17 acres in size and rich with tropical foliage and orchids. Do you have a restaurant on the property? A snack bar/grill is available and serves a variety of delicious foods at the dolphin facility. Can I bring my own masks fins and snorkels? Yes you can to use during your dolphin program and private facility beach. Water shoes may be worn instead of fins for parts of the ray and sea lion swim, but we do not provide these so bring your own. Do we have to pay extra entrance and parking fees ? No. 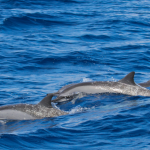 There are no extra entrance or parking fees when snorkeling or the dolphin program. Does the individual meet the age requirement? Can someone who is blind participate? Yes, this individual must be accompanied in the water by a paid assistant. The assistant, he/she must pay the full regular price. Are glasses/contacts permitted in the water? Contact lenses can be worn. Prescription glasses with clear lenses will be permitted only if they are needed but they cannot be removed at anytime (including for pictures) during the session. Glasses with dark lenses are not permitted unless the individual is sensitive to sunlight, in which case a doctor’s letter will need to be necessary. Includes: Dolphin Swim & Snorkel Combo – A 30 minute shallow and deep water experience including touching, training with a dolphin and the opportunity for a deep-water interaction with a dolphin like a dorsal fin ride from one of the pool to the other, foot push, belly ride, free swimming with the dolphin, plus 1 1/2 Hour Guided Instructional John Pennekamp Ocean Reef Snorkel Trip, General Admission to Park, Dolphin Show, Marine Tour, and other Marine Animal Shows. Age 5+ Book Now!